15 images available; click on one to open viewer. Wild specimen from Trinidad, type locality of the species. The origins of commercially-produced 'C. aeneus' remain unclear. 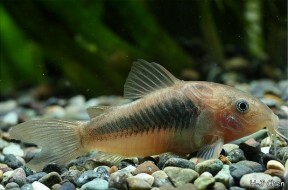 This melanistic fish is sometimes referred to by the invalid names 'C. schultzei black' or 'C. 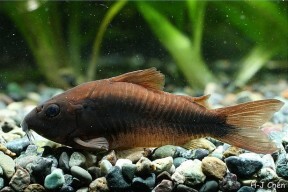 venezuelanus black', but it is in fact a line-bred aquarium fish (see 'Notes'). 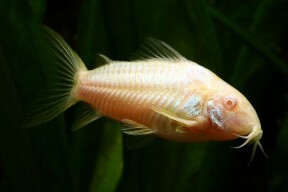 Albino form of C. aeneus, aquarium strain. 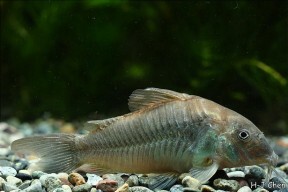 This fish is usually labelled 'C. venezuelanus', but that name is an invalid synonym of C. aeneus. It may be the form known from northern Venezuela (see 'Notes'). Another of the forms often referred to using the invalid name < i>. This may be the llanos-dwelling fish originally named C. venezuelanus black'. Old adult specimen of the form sometimes referred to by the invalid name 'C. schultzei'. Wild fish of uncertain origin. Young individual of the commercial form. Adult pair of the commercial strain, female at top. 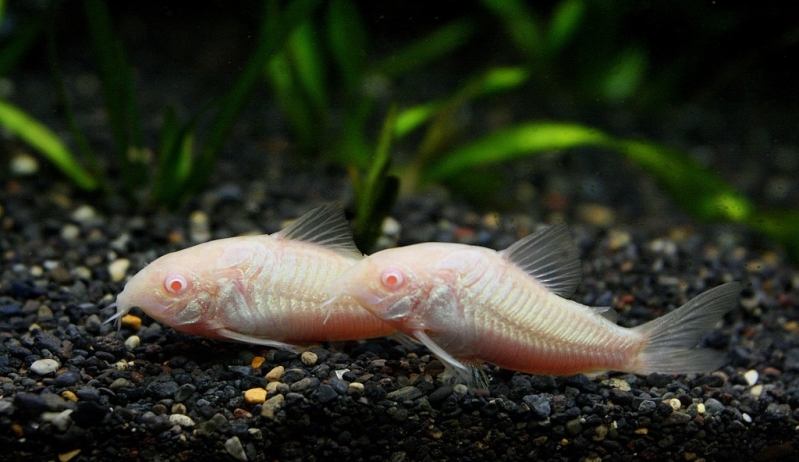 The albino strain is a popular aquarium fish. 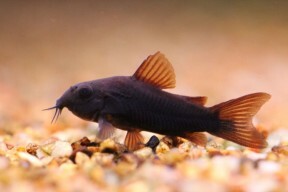 The 'black' form of C. aeneus was fixed via selective breeding of fish exhibiting a natural pigment mutation. aeneus: from the Latin aeneus, meaning ‘of bronze’, in allusion to the brassy, golden-green body colour. Type locality is ‘Trinidad Island, West Indies’, and it still occurs in some river systems of central and southern parts of the island. Its wider distribution appears in serious question, however, as does its taxonomy (see ‘Notes’). Currently it’s accepted to occur throughout much of South America from Colombia and Trinidad in the north as far south as the Río de la Plata drainage at the border of Uruguay and Argentina. Records thus exist from Argentina, Bolivia, Brazil, Colombia, French Guiana, Guyana, Paraguay, Peru, Suriname, Trinidad and Tobago and Venezuela, but this gigantic range seems more akin to that of a complex of similar-looking, distinct taxa rather than a single species. Fish traded as C. aeneus have been ubiquitous in the aquarium hobby for decades, with the vast majority of these farmed in commercial facilities around the world. However, given the taxonomic confusion surrounding the species it’s difficult to escape suspicions that they might not represent C. aeneus sensu stricto, or that over the years more than a single species has been mixed into the bloodline at some point(s). Base dimensions of 80 ∗ 30 cm or equivalent are recommended for long-term care. 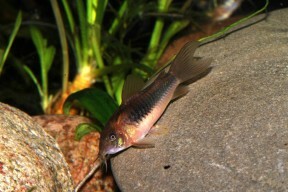 This species is among the most well-known in the aquarium hobby and can be found on sale in most stores. There also exist selectively-bred albino and ‘long-finned’ strains, while mutated ‘short-bodied’ and artificially-dyed specimens have been available for a number of years. Despite the ubiquity of its name in aquarium literature confusion surrounds its true identity, however. 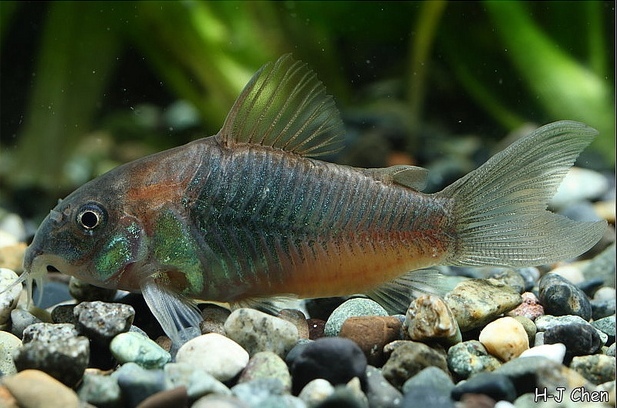 Given it’s the only member of the genus occurring on the island, fish from Trinidad do presumably represent C. aeneus, but the classification of those from other localities appears far from certain. Currently it’s accepted to occur throughout much of South America, and indeed similarly-patterned fish do occur across a large portion of the continent. Some of these, such as the green (CW009) and gold (CW010) ‘laser corys’ are already assigned C or CW numbers and well-known to aquarists, while others are not. 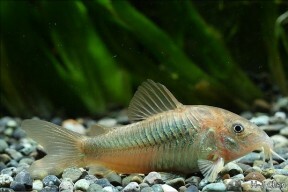 Corydoras microps Eigenmann & Kennedy, 1903. Type locality: from a small lagoon, half dry, near the Rio Branco (Mato Grosso, Brazil). 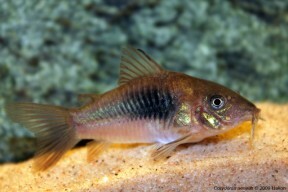 Corydoras venezuelanus Ihering, 1911: Type locality: Río Cabriales, Valencia, Est. Carabobo, Venezuela. Corydoras macrosteus Regan, 1912a: Type locality: Rio Piracicaba, San Paulo, Brazil. 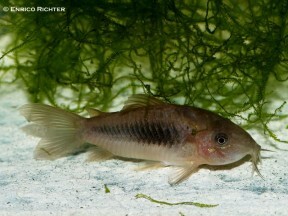 Corydoras schultzei Holly, 1940: Type locality: aquarium specimen (said to be from very small water-courses of the Amazon). 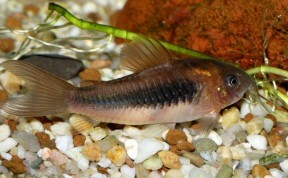 Of these, C. schultzei has been routinely misapplied to a melanistic strain of aquarium C. aeneus which exhibits a blackish colour pattern, is often traded as ‘C. schultzei black’ and said to be exported from Venezuela. The melanistic fish were in fact first recorded in Germany in the early 1990s with a handful of dark-coloured fry appearing in a batch captive-bred from a form of C. aeneus. These were line-bred to fix the unusual trait and subsequently appeared in the trade. The fry possess orangish fins as do those of a form of C. aeneus exported from the llanos of Colombia and Venezuela which is able to darken its colouration when stressed and known as ‘C. venezuelanus black’ (see below for more about this form), so this is where the confusion may have started. As a result the line-bred fish now tend to be traded under both of these names, despite neither being correct, and the appearance of wild ‘C. venezuelanus black’ remains somewhat vague with more than one species possibly confused under the name. The name C. schultzei has also been applied to a fish usually exported from Peru and sometimes referred to as ‘gold flash’ or ‘Peru gold-stripe’ cory (not to be confused with the ‘gold laser’, CW010, or ‘gold stripe’, CW014/C023, forms). 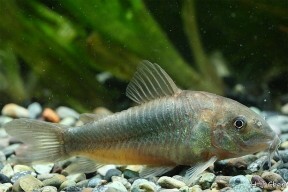 This does appear distinct from other C. aeneus-type fish and may well prove to be so, but because the type locality of C. schultzei is not known, the original description has proven unobtainable thus far, and it remains invalid in an official sense, we’ve chosen to retain the name in synonymy with C. aeneus for the time being. C. venezuelanus is another name that has not been considered scientifically valid for a number of years but is widely used in aquarium literature. As with C. schultzei this appears to have occurred in the absence of any detailed rediagnosis and it’s unclear which characters should be used to define the species. The name may well be applicable to a Corydoras sp. inhabiting the states of Miranda, Aragua and Carabobo in northern Venezuela, although it’s more often used in reference to ‘C. venezuelanus black’. However in the absence of official confirmation C. venezuelanus is also retained as a synonym of C. aeneus here. Synopsis of the fresh water fishes of the western portion of the island of Trinidad, W. I. 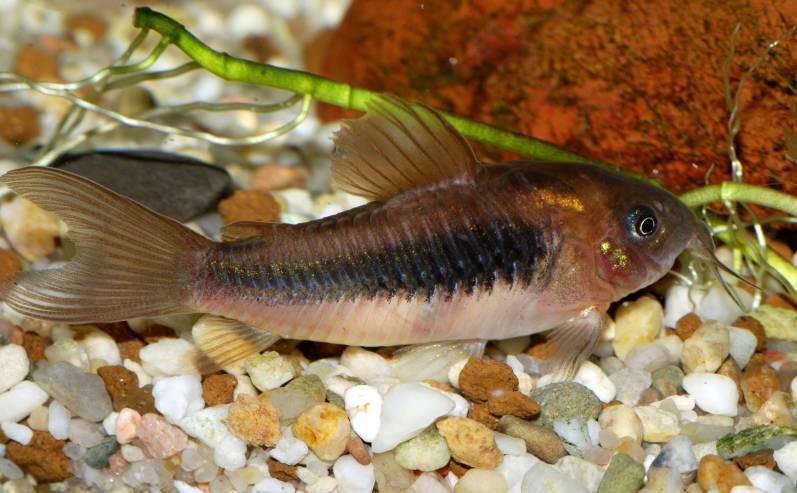 A new species of Corydoras Lacépède (Siluriformes: Callichthyidae) from the Rio Tapajós basin and its phylogenetic implications. A review of the genus Corydoras Lacépède, 1803 (Pisces, Siluriformes, Callichthyidae). 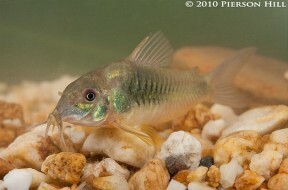 Annotated list and key to the stream fishes of Trinidad & Tobago.